This page does NOT describe how LinuxCNC works. Instead, it describes how other controls work. In some cases, LinuxCNC may work similarly to the descriptions below. In other cases, it will work entirely differently. 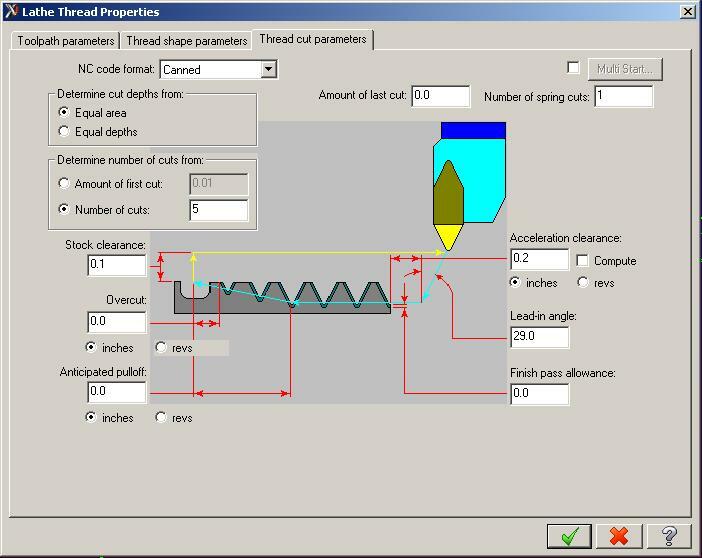 CNC lathe operation has been a topic of discussion as long as rayh and probably mshaver have been hanging around this software. This page is designed to provide a comprehensive set of specifications for this essential ability. There are a number of different sets of codes used by cnc makers to handle lathe specific operations. Included are those from a couple of sources. These are not meant to be overwhelming. They are intended to show the range of operations possible on common commercial lathes. As we begin to build in lathe functionality, we need to do it in a way that permits the expansion of functionality without the need to rewrite earlier abilities. They select either tpi or lead using a parameter elsewhere. Cuts a thread with one finishing cut, no chamfer on the exit of the tool, with a tool tip angle of 60deg. It will have a minimim depth of cut of .1mm and will have a finishing allowance of .2mm. The minor diameter of the thread is 60.64mm and it will cut a thread 25mm long in the Z minus direction. The height of the thread is 3.68mm and the depth of the first cut is 1.8mm and the thread has a lead of 6mm. This thread is a straight thread with no taper. Are Q, R, I, and the second P always in the implied decimal format? Since Z, X, and F are decimalized, it seems kind of strange to mix the two in the same code - doubly so since retrofits have all kinds of different resolutions. Yes for some reason Q,R,I and the 2nd P are as I put in the example, I don't know why but as I said all three Fanuc machines that I have use the same format. Possibly this could be changes in the parameters of the machine. I'm a bit unclear the effect of the chamfering amount in the second two chars of the P word. Is the thread chamfered with the threading tool explicitly by the G76 cycle? Seems like one would want to to this with another tool, but I guess it could be pretty convenient though as part of the threading action. Or is this just "stay out" information so the cycle can be optimized? 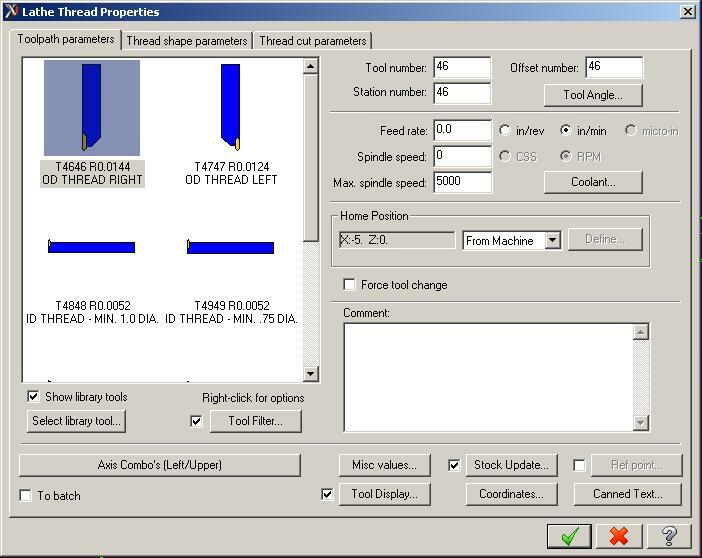 The chamfering amount is on the retraction of the tool at the end of the thread. If you leave this amount at 00 the thread will end in a groove (no chamfer) but if you use 05 this will chamfer the thread out to the major diameter of the thread for a distance of 5mm. The following specification is from a company that wishes to remain nameless here. I'm told that this is the Swiss Army Knife of thread cutting systems. It used a common g33 call but repeated for the number of passes needed to cut and spring the threads to near perfect. NOTE: CYCLE WILL NOT EXECUTE AXIS MOTION UNTIL Z VALUE IS PASSED-IN. ALWAYS PASS-IN Z VALUE IN LAST LINE. B = Number Of Rough Passes. E.G. (.0625-.02/10.-2. )=.0047 FOR EACH SUCCESSIVE PASSES. J = Finish Pass Incremental Depth. K = Plus Or Minus Taper Per Inch/Millimeter?. Plus Taper = +Z DIA. < -Z DIA. M = Spindle On, M3-CW/M4-CCW. O = Tool Orientation. 1, -1, 2, or -2. Q = 1. X-Z Retract At 45 Degrees And Thread Lead Feedrate. EQUAL TO THE DEPTH OF THREAD, PLUS L842 VALUE. R = X-axis Incremental Start/Retract? Clearance Distance From Starting Dia. Z = Z-axis Final Absolute Thread Position. clearance equals .1". A 45 deg. X-Z retract is required. 10 deg. infeed. 8 rough passes, and 3 spring passes. First pass depth equals .05". Finish pass depth equals .01. The tool tip points in a plus X direction. successive passes will be of equal depth. #2) Same example as #1, but make this thread a minus .75 taper per foot. Create a (2) line call. Gxxx B8. C3. E,1./10., I.05 J.01 K,-.75/12., O1. Q1. R.1 U4.5 V5. make multiple start threads equal to 4 starts. Create a (2) line call. 3) Macros->Threading: pick the tool, the thread type and the 0.25-20_AS file. Specify the start position in Z ( .1? ), End pos Z ( -1? ), it will ask Dia. 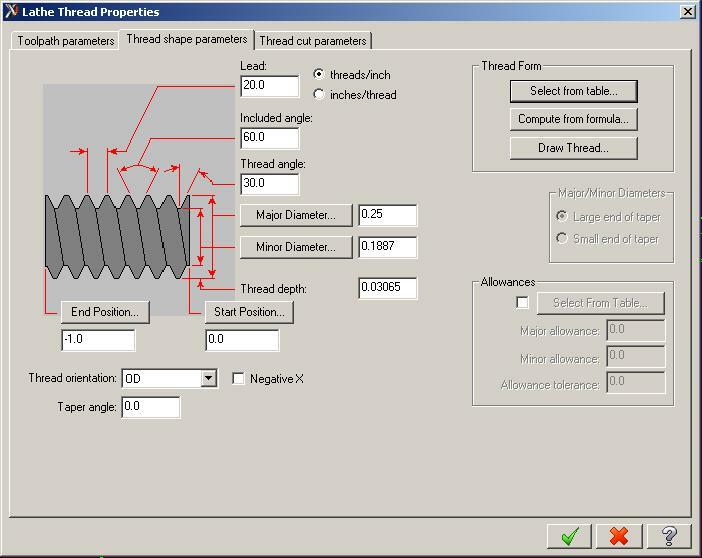 This program shows some modification of a 1/4-20 thread.